From Akiko Higashimura comes the story of Tsukimi Kurashita and the women of the Amamizukan, a communal home for fujoshis. Tsukimi and her friends live quiet lives dedicated to the objects of their obsession until Tsukimi brings home Kuronosuke, a pretty, stylish person! The arrival of the crossdressing Kuronosuke is only the start of things, and soon the socially awkward group is embroiled in a struggle to save their home! 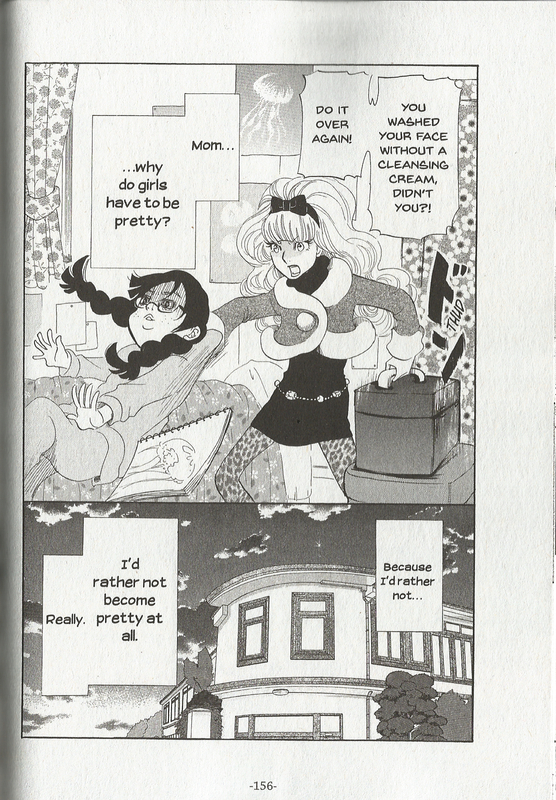 All this and more in Princess Jellyfish, Vol. 1. Akiko Higashimura does a fantastic job at introducing the surprisingly large cast and getting their personalities across quickly and clearly. Most of the story is told through Tsukimi’s point of view and we spend quite a bit of time getting to know her history and her many insecurities. Much of the action of the story revolves around her and the burgeoning love triangle with Kuronosuke, his brother Shu and the way this relationship leads her to introspection and self discovery along the way. When you add in the rest of the wacky cast of Amamizukan, like Banba, who remains cool and collected even when her hair’s on fire, and Mayaya, a hyperactive fan of Romance of the Three Kingdoms and you’ve got all the ingredients to a pretty fun read right there. While that might be enough for most people, Higashimura adds an extra layer that’s at play beneath the comedic hijinks. She uses the cast to look at the way men and women interact, their prescribed gender roles and what society expects from them. Tsukimi and the women of Amamizukan are presented as hermits who eschew the traditional roles of women in Japanese society, living off family members, dedicating themselves to lives free of men and dedicated to their respective obsession. When Shu, a dutiful and respectable son, is introduced his reaction to them is immediate disgust and dismissal. This reaction is so extreme that he even fails to recognize Tsukimi at times when she’s not dressed in a more traditionally feminine manner. Tsukimi herself is shown to struggle with society’s expectations of women being pretty vs. her desire to live her life the way she wants to. At one point she even laments and wonders if women have to pretty to be happy and wishes physical attractiveness wasn’t so important. What makes this even better is that, despite all these themes and questions, it never becomes ponderous or preachy and it never gets in the way of the humor and hijinks that give Princess Jellyfish much of it’s charm. Visually the book is strong and Higashimura’s sense of comedic timing and pacing are pretty amazing. While there are plenty of emotional over reactions played up for laughs, there’s something natural and unforced about them due to the high strung, incredibly awkward personalities and nature of the characters. When Tsukimi goes fetal and rolls around defensively, it looks goofy and silly but also feels like something that someone as painfully introverted as she is might do. Likewise, when he friends get hyper and ramble on about their obsessions in over the top ways, it makes perfect sense for their characters. 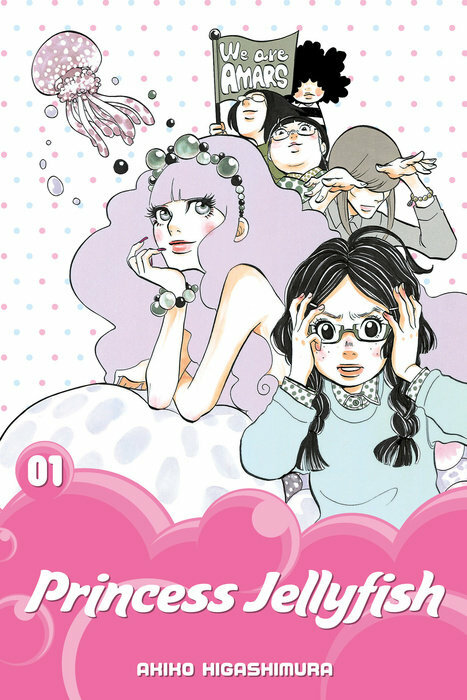 Princess Jellyfish has gotten quite a buzz via word of mouth lately and after reading the first volume it’s easy to see why. Akiko Higashimura’s crafted an engaging tale about social awkwardness, the desire for love, the pressures to fit in and has wrapped it up in a wonderfully goofy package. Come for the wacky hijinks and love triangle drama, stay for the social commentary. Perhaps the best thing about it, is that it’s so well crafted that both seem solid enough to stand on their own, but together they become something really special. Princess Jellyfish, Vol. 1 is available now from Kodansha Comics. Review copy provided by the publisher.